The world's greatest buildings provide a window on great math and great design. One of the world's great buildings, the Sydney Opera House provides an illuminating example of a challenging architectural -- and mathematical -- problem. Inside Science Minds presents an ongoing series of guest columnists and personal perspectives presented by scientists, engineers, mathematicians, and others in the science community showcasing some of the most interesting ideas in science today. The opinions contained in this piece are those of the author and do not necessarily reflect those of Inside Science nor the American Institute of Physics and its Member Societies. (Inside Science Minds) -- Mathematics and architecture are two sides of the same golden coin. On the one side is mathematics, and its capacity to enhance the understanding of architecture, both aesthetic aspects such as symmetry and proportion, and structural aspects such as loads, thrusts, and reactions. On the other side is architecture, as an attractive setting that allows basic abstract and abstruse mathematics to become visible and more transparent. 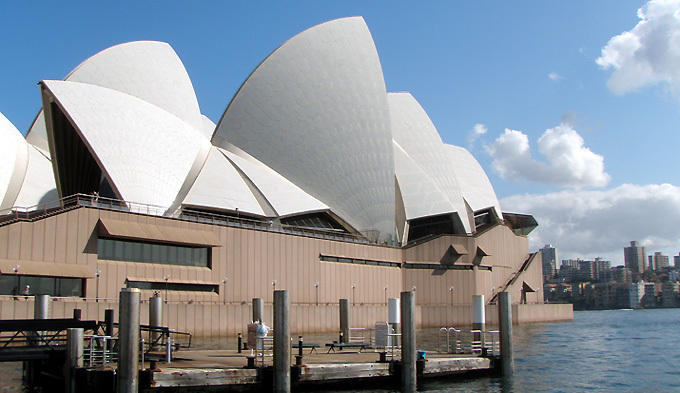 One of the world's great buildings, the Sydney Opera House, provides an illuminating example. In January 1957, the young Danish architect Jørn Utzon won a competition to design an opera and concert hall complex on a dramatic piece of land that juts into Sydney Harbor. Utzon's design featured an arrangement of soaring vaulted roofs that looked like a cluster of sailboats under full sail. However, the path from Utzon's imaginative design of the vaults to their realization would prove to be a formidable challenge. It would take from 1957 to 1963 -- years of exploration, analysis, disagreements, and hard work -- to determine a workable combination of geometry, materials, and methods of construction. Roof structures of this size and complexity cannot be built without an explicit geometry that can be expressed mathematically. Without such a mathematical model, it is not possible to calculate the loads, stresses, and rotational forces to which the vaults will be subjected and to estimate the impact of wind and temperature changes on their stability. Parabolas and ellipses were Utzon's first choices for the profiles of the vaults, but neither provided a buildable option. Ove Arup and the engineers of his London-based firm had been chosen to partner with Utzon in the execution of the structure. It had been their initial thought to build the vaults as thin, concrete, egg-like shells. Such roofs were coming into use at the time. In fact, Arup's firm had designed such roofs with concrete shells only 3 inches thick. However, Utzon's pointed, steeply rising vaults were not compatible with such a design. Utzon and Arup had to find a different solution. Arup became convinced that each of the sail-like roof structures could only be built as a sequence of curving ribs -- narrow at the bottom and increasingly wide as they rise -- that would spring from a common point and fan outward and upward from there. Each roof vault would consists of two such curving fan-like structures -- one the mirror image of the other -- soaring upward from opposite sides to meet at a circular ridge at the top. Utzon endorsed this concept enthusiastically. "I don't care what it costs, I don't care what scandal it causes, I don't care how long it takes, but that's what I want," Utzon said. This solved one problem, but the problem of the geometry remained. Was there a geometry that would make it possible to build the curving sail-like structures with standardized, mass-produced components? If the answer was no, then it would be impossible to execute Utzon's design and the project would collapse. Suddenly Utzon had a flash of an idea. The only surface that curves in the same way in all directions is a sphere of a given radius. Because a limitless variety of curving triangles can be drawn on a sphere, all the shells for his roofs could be designed as curving triangles on a sphere, the same sphere! This was the idea that saved the project. To visualize what triangles Utzon had in mind, start with an orange and cut it exactly in half. Put one of the halves on a cutting board, flat side down, and cut through it at two different angles to obtain a perfect wedge. Leave the wedge in its position and slice through the half of the orange perpendicularly to the cutting board but at an angle with the wedge. Your cut has separated the wedge into a larger and smaller segment. Clean all the flesh from the smaller segment carefully until only the peel remains. This curving triangular piece joined to its mirror image is a model of Utzon's vault geometry. Weighing matters of both aesthetics and structure, Utzon and Arup decided on 246 feet as the radius of the sphere from which the design of all the matching pairs of spherical triangles would be taken. By conceiving of the spherical triangular shell of each roof vault as consisting of a fan-shaped arrangement of ribs -- and each rib as a configuration of segments -- it was possible to construct the vaults from mass produced repeating components. The teams of Utzon and Arup could now complete the particulars of the design. The segments of the ribs are built with pre-stressed concrete. Their cross-sections are designed to vary from a narrow T at the bottom, to a narrow solid Y, to a wider, open Y higher up. This pattern of segments flows upward in exactly the same way for each of the shells. The heights of the shells determine the extent of this flow. At the same height, the rib segments of any two shells are identical. Only if one shell is higher than the other is there a difference in the upward flow of the rib segments. A total of 1,498 standard rib segments of 12 different types and another 280 nonstandard segments were cast, each 15 feet long. With heavy construction cranes and an erection arch made of a curving steel truss, sequences of rib segments were placed into position, and each triangular shell and its mirror image rose to completion simultaneously, segment by segment, one matching pair of ribs at a time. Utzon and Arup knew that the idea of the single geometry had been a critical advance. When Arup recalled later that "we did not want to pull the architect down to hell, but we wanted him to pull us up to heaven," it was this breakthrough that he had in mind. Utzon was certainly influenced by Arup's single-minded focus on "how do we build it?" However, the spherical solution had been his. The remaining challenge was to cover and seal the outer surfaces of the shells. This required a sophisticated tile system. Tiles configured in V-shaped formations, or lids, were locked into place with brackets and bolts that could be adjusted to give them the precise orientation they needed to have on the spherical surface. This required more mathematics and computer analysis. When the last lid was lowered into position in January 1967, the roof vaults of the opera complex were finally complete. Construction delays and budget overruns held up the completion of the opera project for over 16 years. They also led to Utzon's resignation before the last lid of the tiled surface of the vaults was in place. Finally, on Oct. 20, 1973, 16 years after Utzon had won the competition, Australia celebrated the opening of its performance hall complex with the queen of England in attendance. The Sydney Opera is a large, white sculpture that catches and mirrors the sky of its harbor setting with all its varied lights from dawn to dusk, day in and day out. It has captured the imagination of people the world over and has become a symbol not only of the city of Sydney, but all of Australia. Alexander J. Hahn is professor of mathematics at the University of Notre Dame in Indiana. His research has focused primarily on topics in algebra and the theory of numbers. He has also explored the history of mathematics and science and has recently published "Mathematical Excursions to the World's Great Buildings" with Princeton University Press.